You will earn 8,565 Reward Points. Earn 1 reward point for every 1 dollar spent. Traulsen's TU Series full size undercounter refrigerator models are designed for use with most applications, combining the advantages of modular flexibility with ease of maintenance. They are built to perform, their heavy duty construction, quality components and innovative design are all intended to provide a high quality, durable product you can depend upon. Our undercounter models feature a door or drawer option. We've engineers our models with a drop-in feature that allows you to easily convert doors into two 6" deep drawers or three 4" deep drawers, making them ideal for any work area reorganization. 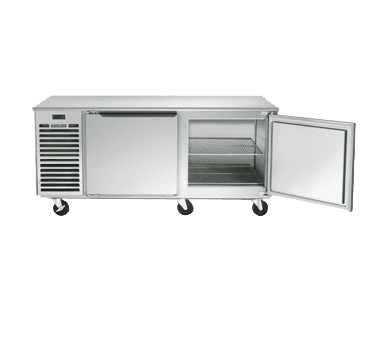 Additionally, we meet the needs of today's food service operators by providing assured product holding temperatures, maximized storage capacity and features that assist with HACCP compliance, making them an excellent choice and value. That's Traulsen. Trusted. No. 1 Type Tray Slides To Accommodate either (1) 18" x 26" or (2) 14" x 18" Sheet Pans, Adjustable To 2" O.C. Universal Type Tray Slides To Accommodate either (1) 18" x 26", (2) 12" x 20" or (2) 14" x 18" Sheet Pans, Adjustable To 4" O.C. Cabinet exterior front, sides, one-piece louver assembly and doors are constructed of stainless steel. Cabinet interior and door liners are constructed of stainless steel. The exterior cabinet sub-top, back and bottom are constructed of heavy gauge aluminized steel. A set of adjustable 6" high stainless steel legs are included. Doors are equipped with a gasket protecting metal door pan. A metal door handle with gasket guard is standard on all units Easily removable for cleaning, vinyl magnetic door gasket assures tight door seal. Anti condensate heaters are located behind each door opening. Both the cabinet and door(s) are insulated with an average of 2" thick high density, non-CFC, foamed in place polyurethane. Standard interior arrangements include two (2) wire shelves per door, mounted on shelf pins. Recommended load limit per shelf should not exceed 225 lbs. Optional tray slides may be purchased in combination with, or in lieu of these. Both standard and optional interior arrangements are completely installed at the factory. The self-contained, balanced refrigeration system using R-404A refrigerant features a hot gas evaporator defrost, thermostatic expansion valve, air-cooled hermetic compressor, plenum effect blower coil, large, high humidity evaporator coil located outside the food zone and an electric condensate evaporator. A 9' cord and plug is provided. Standard operating temperature is 34 to 38°F. The easy to use water resistant INTELA-TRAUL® microprocessor control system is supplied standard. Unit is NAFEM Data Protocol communication (NDP) ready. Optional hardware required to be NDP compliant. Third party software required for network connection. It includes a 3-Digit LED Display, Fahrenheit or Celsius Temperature Scale Display Capability, and an RS485 data port. In addition it includes audio/visual alarms for: Hi/Lo Cabinet Temperature, Clean Condenser, Evaporator Coil and Discharge Line Sensor Failures, and Power Supply Interruption.